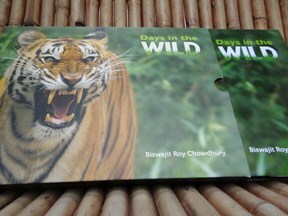 A valuable Coffee Table Book On Indian Wildlife at a very special price for nature lovers who care! Biswajit Roy Chowdhury has been a keen birder and a well-known wildlife conservationist and photographer for the past three decades. He has executed many wildlife projects delegated by the Ministry of Environment & Forests, Govt. Of India, World Bank, UNDP, State Forest Departments, Government of United Kingdom, Federal Government of United States and AMN AMRO Foundation. His many publications include Wild Wonders of India and Nepal and Wild Wonders of Asia, The Sunderbans: A Photographic Field Guide, Sunderban: The Mystic Mangrove and Wild Wonders of India. From snow leopards in the Himalayan wildernesses to a whale shark in the Arabian Sea off Gujarat, from the tropical rain forests of the Western Ghats to the mangrove forests of the Sunderbans... the call of the wild grew louder in his heart with every passing day. Packed with about 500 breathtaking images of India's flora and fauna — the result of four decades of hard work — his book 'Days In The Wild' is now available. The lively pictures, combined with quick facts, promise to take readers close to the heart of wild India while building up awareness and the urge to protect it.